These are extremely dangerous. In fact, I know people who have eaten the entire thing from the bowl before it is complete. You have been warned. Normally I do not use coconut oil but every blue moon, especially around the holidays, you need something purely decadent. Look no further. 2 tablespoons refined coconut oil. Can substitute sunflower or safflower oil. 1 tablespoon soy milk. Can substitute rice milk, almond milk or other nondairy milk. If using coconut oil, place in a small saucepan and heat on low flame to melt. Once melted, pour into a small mixing bowl. If using another oil such as sunflower or safflower, no need to melt (obviously). Add soy milk, maple syrup and vanilla extract. Whisk together. Add the maple syrup granules and salt and whisk further. In a separate bowl, combine oat and almond flours. Slowly add liquid ingredients to the flour stirring until the mixture is a soft doughy consistency. Add the chocolate chips and stir to evenly distribute. Place the dough in the refrigerator for 30 minutes. The dough will stiffen during this time. Shape into squares using your hands or, if you prefer, use a teaspoon or cookie scoop and make balls. Enjoy! 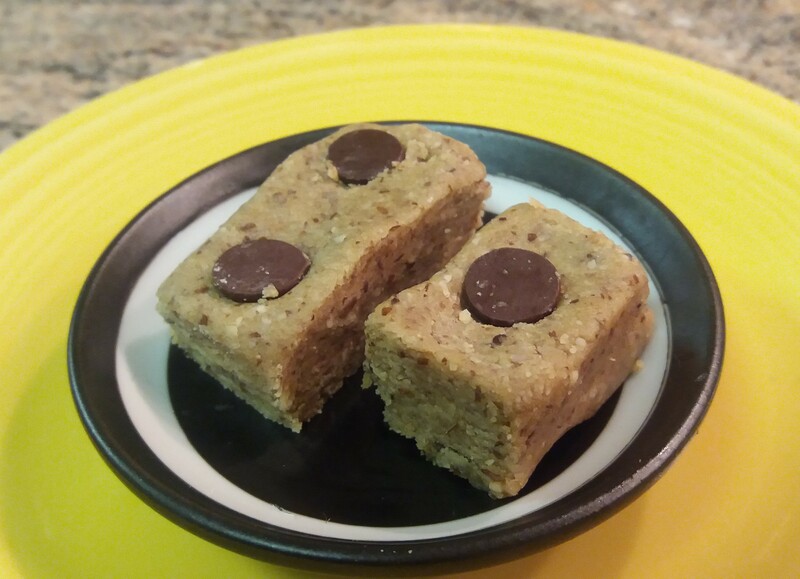 optional modification: Rather than form into squares with your hands, you can go more professional looking and create cookie dough bars by patting the dough onto parchment paper, refrigerate for another 20 minutes, then slice and serve.